Tesla is continuing to roll out its updated Autopilot software to Model S and Model X cars build since October, the company’s founder Elon Musk confirmed over the weekend, and that includes a speed-limited version of the Autosteer function. The latest rollout is essentially the same release that was sent to 1,000 Tesla owners earlier this month and covers all cars build since October 2016, when the company switched over it’s factory from installing first generation Autopilot hardware to the latest generation. Most notably, Autosteer, the function of Autopilot that keeps the vehicle within a lane and works using the vehicle’s traffic-aware cruise control (TACC) system, will be limited to 45 mph and confined for use only on highways with clear lane markings. The TACC, which adjusts speed based on the vehicle in front of the driver, also has an update, and can be used at a max 75 mph. Musk also said some newer vehicles receiving the update will need to have their camera angles adjusted at a Tesla service center. The Verge noted that new Teslas receiving the update won’t be equipped with the same safety features that older vehicles have, like automatic emergency breaking. 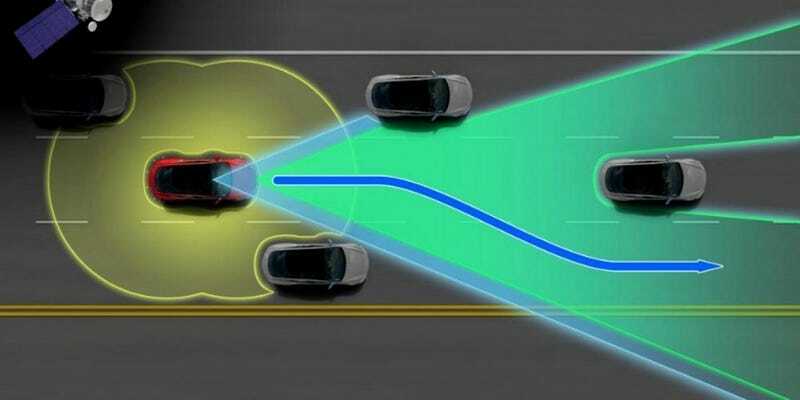 But the rollout includes the Forward Collision Warning feature, which is designed to alert the driver with an audible sound if a collision appears likely with an object in the motorist’s path. Musk said the speed limit for Autosteer will increase at the company receives more data.